In most business deals you need to have a firm understanding of your target audience in terms of your customer or client, whomever it is you plan to ultimately profit off of. 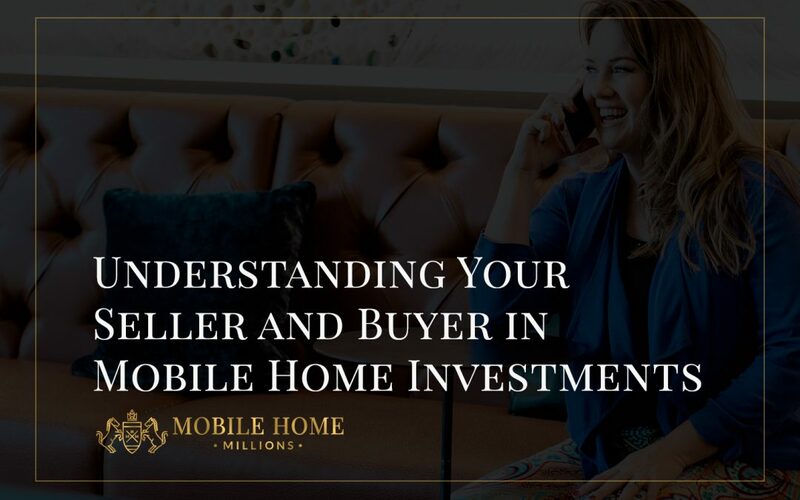 In mobile home investing, there is a substantial addition to that factor and a savvy investor needs to understand more than the end consumer, they must also understand the seller. If you understand the person you are buying from you have the potential to realize a far greater profit. As I discussed previously, there is absolutely an art to investing in mobile homes. You aren’t buying groceries or even a car, you are paying for an investment with the intention of profiting almost instantly. You want to find an amazing deal and maybe even negotiate it better. This takes more than a cursory understanding of your seller. After all, if they knew what you know they would likely choose to profit instead of allowing you to do so. And why aren’t they staying in it to win it? This is a good place to fill in blanks as best as you can. Is there something really wrong with the property? If that is the case, is the issue manageable? Sometimes the seller is perceiving an issue to be a bigger hassle than it actually is. Sellers SHOULD be forthcoming in this area but rarely are, so be thorough in your inspection. Another reason the seller may not be interested in doing what it takes to maximize their own profit is timing. Understanding their underlying motivation to sell is absolutely key here. In one instance a family member had health issues and the seller’s only thought was getting out from under their perceived burden to be near the ailing family member. Another seller had married and was in a hurry to relocate to the spouse’s house in another town. Perhaps most common, the seller is going through some sort of financial hardship and no longer desires to or simply no longer can pay for the home. All of these situations may mean any offer is desirable and the seller is not taking the time to discriminate or make everyone hold out for better options. Sellers may need your help and look to you as an authority in the dealings. Sellers may be governed by fear and desperation. Sellers may not be able to find any serious buyers. Sellers may view their property as an undesirable liability. Sellers may have unrealistic expectations regarding the sale. Alternatively, an understanding of the buyer is a more expected but equally important aspect of mobile home investing. Just as the knowledge of what motivates a seller to sell can help you land the best deal in your investment proceedings, so does an understanding of the motivations behind the right buyer. For instance, does the buyer have a time limit they are operating under? Is there any reason the buyer might be turned down if buying within a mobile home park and needing the approval of the park managers? After all, most buyers have to go through an approval process before being approved to live within a mobile home park. This is a great topic we will cover in another post; the benefits of buying on private property as compared to the assumed ease of buying in a mobile home park. Still, there are other things to keep in mind when it comes to your buyer. How much money do they have to put down and what can they pay monthly? What are their needs and what drives them? Just as it helps to know the motivators of sellers on a home you are considering investing in, so does it benefit you to understand the motivators of any candidate looking to buy. You have a better opportunity to understand your potential buyer. How is their credit? Do they have a job? Do they have a criminal history limiting their ability to reside in certain places? What are their limitations? What are their expectations? Are those grounded? If not, can they be set straight? Information is power in many aspects of life and it really can be a great tool in your belt when it comes to the flip and sell world of mobile home investing. The more information you can garner on the people and the situations playing a part in the shape of your investment, the more sound it typically can turn out to be. So do your research and get to know the players in the game. Many of the people you deal with are eager for help and appreciate the knowledge you can bring to the table in facilitating smooth and speedy dealings. Finally, try to have fun. When you enjoy what you do you always win–and you are typically far more successful. This is something of a personal motto of mine but truly pertains to navigating the art of mobile home investments.